A spring risotto helps bridge that gap between winter and summer. It's warm and comforting, but loaded with spring veggies and gives you a bit of hope for sunny days ahead. This risotto uses steel cut oats as the grain, boasting a higher protein and fiber content than the rice typically used in this Italian dish. The result is chewy and delicious. In a dutch oven or heavy skillet heat 2 tsp oil over medium high heat. Add onion, bacon, and garlic and sauce until lightly browned. Add steel cut oats and white wine. Stir until wine is absorbed. Add broth, 1/2 cup at a time, stirring until entirely absorbed before adding the next 1/2 cup. Continue until all broth is used and oats are cooked through. Stir in maple syrup, dried herbs, and parmesan cheese. Gently fold in peas. In a small nonstick skillet, heat 1 tsp olive oil and sauté asparagus until just cooked through, 3-4 minutes. Season with salt and ground black pepper. 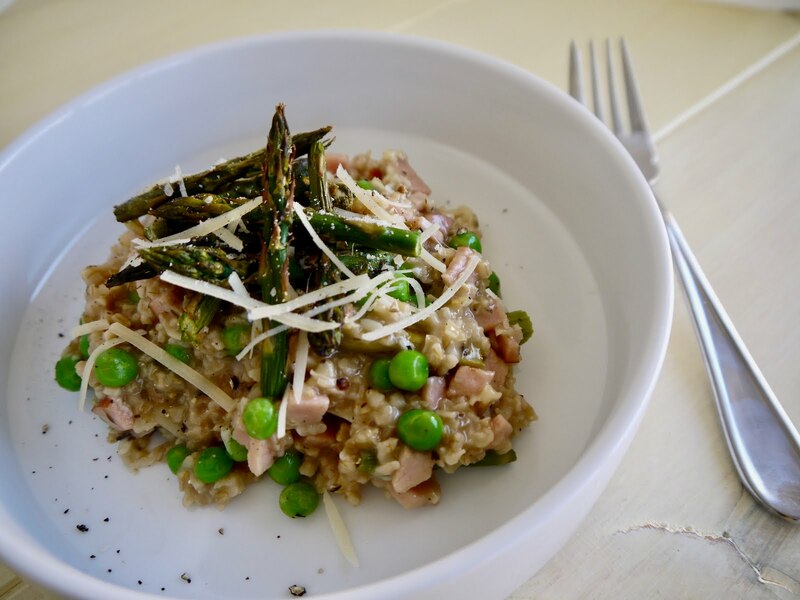 Top each serving of risotto with asparagus spears and additional sprinkles of parmesan cheese if desired.